Common Problems with Old Mowers Solved when you buy a Reconditioned Mower from The Old Lawnmower Company! 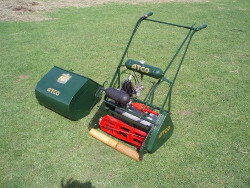 Cylinder Lawnmowers manufactured by companies including Ransomes, Atco and Webb were built to last, however, once any machine reaches a certain age it needs to be thoroughly overhauled to ensure its reliability and performance is maintained. As the country’s leading buyer of old cylinder mowers, we understand the problems that occur with them and understand what is needed to turn them back into reliable and superior quality machines. The Old Lawnmower Company are experts at transforming worn mowers into reliable mowers and every machine that we sell undergoes a high quality restoration, the like of which is very rare, if not impossible, to find elsewhere. Our First Season’s Use Guarantee (supplied with every mower) shows the thoroughness of our work and our confidence in our reconditioned machines. 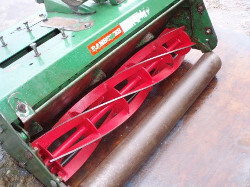 Listed below are problems that we encounter every time we rebuild old mowers. Through experience, a large selection of parts and, most importantly, steadfast commitment, we overcome these problems the vast majority of which are never addressed during routine servicing. This means that an old mower bought from elsewhere is on borrowed time. An old Lawnmower bought from The Old Lawnmower Company offers real value for money. Every mower (from a pushmower to a large motor mower) contains hundreds of components- each one prone to wear or misalignment. Worn components in the transmission greatly affect a mower’s performance and eventually lead to mechanical failure. We inspect every component and, if any wear is detected, replace them. 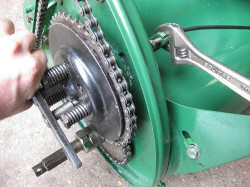 This includes bearings, bushes, chain, cables, clutches - the list is endless! Replacement Engines are often misaligned with clutches and drive-shafts leading to worn parts and then irreparable damage. We retain and rebuild original engines, where possible, only fitting a replacement engine that aligns correctly (beware of engines made to metric dimensions fitted to imperial machines). 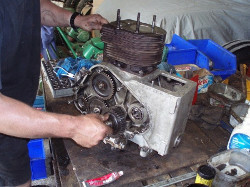 A rebuilt engine is easy to start, powerful; runs smoothly and efficiently. 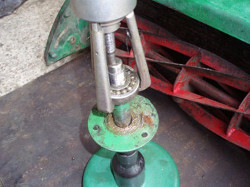 Worn cutting cylinders reduce the ability of the mower to cut and throw the grass to the back of the grassbox (ie. filling it). 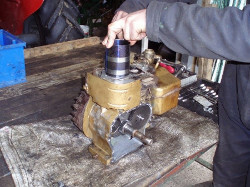 We ensure that unworn and, where necessary, new cutting cylinders are fitted because we have a ready supply of them. 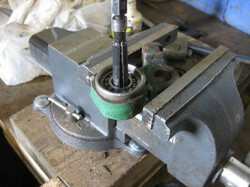 Worn Bottom Blades make it impossible to ‘set’ the cutting cylinder correctly and achieve a good crisp cut. 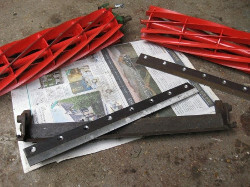 We fit new and unworn bottom blades to achieve the very best quality of cut. 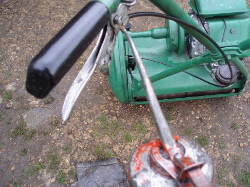 The condition of levers and cables make it hard or impossible to operate/control the mower We fit new and unworn levers and cables to every mower- we can obtain replacements to any cable fitted to one of our mowers (a broken cable makes a mower unusable). 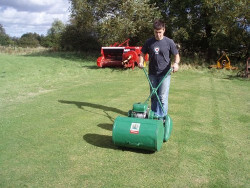 Because they are positioned at the front of the mower, the structure and condition of old grassboxes is often inadequate (which leads to them falling apart) We are able to select the best grassboxes from our extensive range of spare mowers. The quality of repainting and cosmetic work is not up to standard (ie. rough brush-over/blow-over painting, without thorough preparation; wrong colour matching). 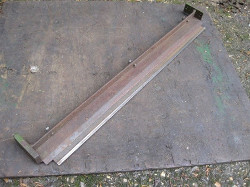 We de-rust panels and components thoroughly, using electrolysis. 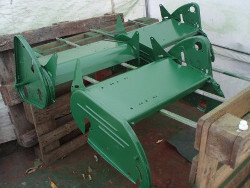 Paint is completely stripped before applying rust inhibitor, primer and a high quality synthetic enamel top coat (matched to the mower’s original livery).